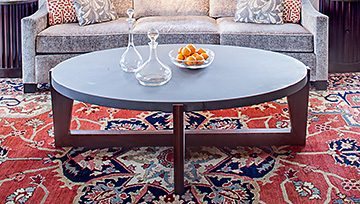 Shaver/Melahn started its first furniture line as an outgrowth of having developed custom designs for several of their interior design clients. Introduced in 1998 Shaver/Melahn’s furniture has been on the forefront of well-designed, high-end bench made furniture made in Wisconsin. Started as a line of tables and casegoods the line has expanded to include upholster, lighting and accessories. 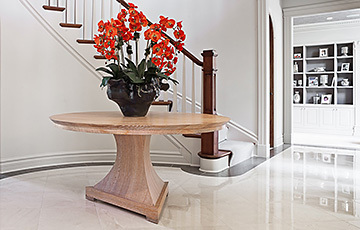 Sought by designers across the country the designers take pride in in the hallmarks of all of their furniture: beautiful design and attention to materials and details. 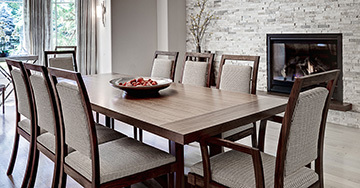 Since then they have added two additional lines to their product repertoire, the Mendota Collection with its modern interpretation of the American Arts & Crafts movement and the Flambeau Collection, a sleek contemporary line. All lines are made in Wisconsin using native materials. The lines have been featured in many shelter and trade magazines, their furniture has graced homes all around the world, been used in public areas of hotels and residential lobbies and public buildings such as the Clinton Presidential Library.